2 kylpyhuonetta, joissa yksi ensuite off makuuhuone. Ikkunat ja parveke lasi sävytetään, jotta valoa, mutta vierailijat allas tai muu asunnot eivät näe sisään. Parveke täysin kalustettu, kaksinkertainen rakkaus istuin 2 tuolia mukavasti pehmustettu ja suuri lasi sohvapöytä. Upea näkymä altaan pituudelle, joten ei tuijota naapureita toisella puolella. Myös suuri kolmas kerros nurkassa, viileä aamulla ja iltapäivällä, koska ei ole suoraa auringonvaloa. Makuuhuoneessa on king size-vuode, paksu pussilakana ja laadukkaat vuodevaatteet varustettu lakanat. Suuri koko oma kylpyhuone sadesuihkulla. 40 "taulutelevisio, kaapeli mukana ja rakennettu teak peilattu kaappeja paljon varastointia makuuhuoneessa. Pyyhi verhot ja hiljaa hyvää nukkua varten. Varaushuoneessa on queen-size-vuode, pussilakanat ja laadukkaat vuodevaatteet, joissa on asennettu lakanat. Myös teakpeilinen kaappi lisävarastointia varten. Windowsissa on näytöt ja mustat verhot, jotka takaavat hyvän unta. Keittiö on täysin varustettu, mikroaaltouuni, leivänpaahdin, kahvinkeitin ja vedenkeitin. Sisältää kattiloita, lasit, kupit, ruokailuvälineet, korkkiruuvit ja astiat 6 hengelle. Suuri 4-paikkainen pöytä, mukavat tuolit. Olohuoneessa on 50 tuuman taulutelevisio, jossa on kotiteatteri, surround-ääni ja DVD-soitin. Mukava sohva, sohvapöytä, parveke ja tv. Seinäkokoinen peili tekee huoneesta kirkkaamman ja suuremman tilan. Tv-paketti ja nopea langaton internet sisältyvät hintaan. Ranta on lyhyt 100 metrin kävelymatka ja voi saada vihreän bussimatkan alas kaupunkia, elokuvia ja yömarkkinoita, kaikki alle 10 minuutin päässä. Uima-allas, kuntosali ja lastenhuone, valokuvat näyttävät kaikki. Mutta sinä näet sen vieläkin mukavamman. Suuri parille, jotka pitävät tilavuudesta. Hyvä hinta myös kahdelle pariskunnalle. Perheet ovat ok, mutta vain 1 queen-size-vuode varahuoneessa, näet kuvissa. Katsokaa iso parveke paras näkymä alas altaan pituus sekä lopussa kulma yhdistää, joka on varjostettu viileitä lämpötiloja aamulla ja iltapäivällä, ei suoraa aurinkoa. Double love seat, lasitettu sohvapöytä ja 2 erillistä tuolia mukavilla tyynyillä. Hyvä paikka pari, joka tykkää lisätilaa tai on 1 lapsi parivuoteella. Voi myös accomadate 2 pariskunnalle. My husband and I spent 6 weeks in this lovely 2 bedroom condo the owner Neil is very prompt in answering any questions you may have regarding this condo. The condo is very private being at the end of a corridor with this in mind you can leave the door open and you get a lovely breeze through the condo. The balcony is always in the shade so this makes it perfect for sitting out there enjoying the beautiful view over the pool the furniture on the balcony is very comfortable and also you get a lovely breeze there too. Neil has chosen the best package for the television and this made my husband’s day especially being able to watch the footy state of origin especially and the Wi-Fi was excellent being able to keep in touch with family a big bonus of having a second television in the main bedroom. The kitchen was very functional especially having a full refrigerator to keep your fresh fruit and drinks I personally chose not to cook as there were so many eating places handy at very reasonable prices. This condo is situated close to public transport local mart and the beach I would recommend this place and would certainly stay at the Seacraze again. Thank you Neil for making our holiday with being able to stay at your place. We just spent almost 10 weeks at this wonderful condo and plan to return. 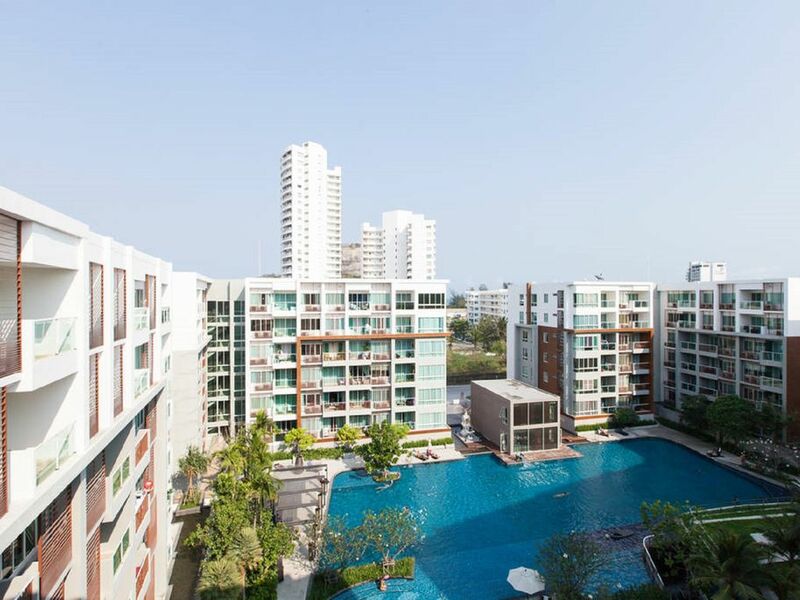 I am almost reluctant to let the secret out but I use other people's reviews so will be fair and share … this condo has to be one of the best in “The Seacraze” at Khao Takiab. We booked ahead for the entire winter season so we were very happy when we found this condo was even nicer than the pictures! The owner Neil is very prompt in answering all questions and was great to deal with. For example, we were arriving late on a Friday night (after 30+ hours of travel) and he stayed in touch until he knew that we arrived safely in the condo. The condo itself has great beds, plenty of linens and towels, lots of clothes storage and very comfortable furniture. It has an ideal location at the end of a quiet hallway. It is one of the few end units with both pool and sea views (not right at the sea, but you can see Gulf of Thailand) which also means lots of windows and a nice cross breeze. The screened windows help with the few pesky mosquitoes that come with tropical climates. “The Seacraze” condo complex is a really nice place to stay. You can’t appreciate just how large the pool is until you see it. It’s amazing! I think it was 50M long and always clean. There is also a well stocked gym. The pleasant office and security/pool staff at Seacraze work very hard to maintain the property. Even the outdoor pool showers were scrubbed regularly. Hua Hin and Khao Takiab are very safe to begin with – but the 24-hour security staff and cameras were reassuring. Khao Takiab is at the south end of Hua Hin which was perfect for us. Quiet roads for walking and biking. Close to Hua Hin by green bus or tuk tuk. We loved the area – right across the road we found our local laundry, bakery, two Family Mart convenience stores and good restaurants (Rua Rimtarn, U-Sa-Mas, Three Chefs were all favourites). It was a short walk to south Khao Takiab beach (our preference) or north to the main Hua Hin beach. We took the green bus to town all the time. Also rented bicycles and rode on the beach to Khao Tao, the next fishing village south. (You can rent a bike from Velo near Cicada Market and store it in the condo covered parking area.) We golfed nearby at Seapines golf course (the Army course, also called Suan Son Pradipat). Neil is a great owner who really cares about his condo and that you have a great holiday there. We can’t recommend it highly enough. Thanks Neil! I have utilized VRBO apartments in many different countries,, in other words I am speaking from experience. From the moment we arrived the office personal were extremely, helpful and accommodating. The Sea Craze property is superb, the amazing MULTI LEVEL POOL, with jacuzzi inclusive in pool is really gorgeous. The surrounding grounds are swept and kept CLEAN EVERY MORNING, it is really a peaceful setting to wake up to or chill out at dusk. The apartment is ABSOLUTELY GREAT, huge flat screen TV with surround with full cable package in living room and large flat screen tv in bedroom. Sofa and beddings are super comfortable, the bathrooms are fully modernized, this apartment and building accommodations are really, really wonderful. The owner Neil is professional and very prompt to your inquiries and needs and was a real pleasure to deal with. I HIGHLY recommend this apartment to any viewer who may be considering staying in Hua Hin, you neither look any more just book this apartment and enjoy. This apartment was very well equipped for short and long-term stays with everything you might need. We stayed here with a young child and settled in very easily. Actually, we felt at home right away! The apartment is well located within the block and since it's at the end of a corridor it is extra peaceful. Neil, the owner, has obviously taken a lot of care to set up the apartment for his tenants and does everything he can to make sure everything's clean (everything gets laundered between tenants including the mattress and pillow protectors!) and ready for you to move in. We found him to be a very nice and reasonable owner to deal with and it's clear that Neil wants his tenants to enjoy their stay. Since the apartment is a corner unit, it's very nice and breezy if you leave the windows open (they have mosquito screens on all the windows except one in the master bedroom). The condo has plenty of facilities and a massive pool. The only complaint we might have was that the pool was icy cold because it doesn't get sun all day and because of its size (it was winter when we stayed so that didn't help). Across the street are a couple of restaurants which serve quite good food, albeit at tourist prices. We liked the Oasis place best for food but the restaurant next door has a very nice atmosphere too. There's a really handy 24-hour coin-op launderette and some massage places within a 2-minute walk too. There are other places to eat further up the street but we didn't try those because we liked staying at home and cooking! There is a good seafood restaurant in Khao Takiab village called Madame Green Seafood and I recommend it. The nearest beach is a stroll away but we didn't go to that one very much as the sand was too filled with beach restaurants and wall-to-wall deckchairs for our tastes. It was high season though so it might be better at a quieter time of year. If you walk further down the beach (towards the south), the beach is quieter. However, we really liked the Suan Son beach which is a 5-minute drive away and is run by the Thai army so it's clean and well run. It has showers, toilets, a mini-mart and some snack stalls. That beach is lined with causarina trees so it's got shade as well as a nice wide sandy beach. That was our favourite place to hang out. I recently stayed at this condo for a week. The condo is exactly as advertised, tastefully furnished with all of the essentials and many extras that you would need or want for a short or extended stay. The building is brand new and it shows compared to many others that I have seen in the area. The pool is very large, you could do laps if you wanted to! 24 hr security gives an added feeling of safety, not that I found any part of Hua Hin that concerned me in that regard. There are 2 beaches easy walking distance, the one north of the big hill goes back towards the city and is quite busy as that is where a lot of the big hotels are located, the other going south was my preference, great beach area where the sand is flat and firm for hiking on, much quieter but still many beach lounge chairs for rent with small places selling food and cold beverages. Hua Hin is a smaller city than other resort areas in south Thailand but it does not lack any ammenities that you would need and there are many things that you can do in the area. Transportation is about 2000 Baht from Bangkok via taxi, I found transport back for 1600. Other methods like bus and train are cheaper but take longer. To get to the city from the condo also has a few different modes, on the back of a bike if you are brave, tuk tuk for 50 bhat I think it was or taxi 200 bhat 1 way. The only drawback I found was the lack of a bbq. All in all I had a great experience and would stay here again if I get back to Hua Hin. Seacraze se itse on mukava hiljainen Soi. Lähes vieressä merenranta golfkenttä ja vain 100 metrin päässä rannasta monia tuoreita mereneläviä kauppoja ja ravintoloita. Hua Hin on joitakin parhaista maailmanluokan golfkenttää kaikissa Thaimaassa, kaikki alle 30 minuutin ajomatkan päässä Seacraze. Sijainti on myös on vain 10 minuutin ajomatkan päässä alueella sekä suuri ostoskeskus teattereita, Home Pro ja iso Tesco lotuses kaikille ruokaostokset tarpeisiin. Ei kaukana frm suuri uusi vesipuisto sekä Night Bazaar on loistava sijainti. Minulla on myös 2 huoneisto vuokra Chiang Mai. Ota yhteyttä minuun kautta tämän sivuston huoneisto vuokra Chiang Mai.